On one side, the Potomac River. On the other side, the C&O Canal. Between these two aquatic icons is 3303 Water Street, which contains 70 loft-style condo units that connect you to Georgetown’s past as a center of industry and its current status as home to fine dining and shopping. Whether you’re looking for 900 square feet of living space or up to 6,600 square feet, these units have a strong European feel, with open-plan kitchens, marble bathroom floors, a rooftop garden terrace, French balconies and patios (in most units), and two entrances: a porte cochere on Water Street and a pedestrian-only entrance on 33rd Street. Blending black metal, brick, and precast concrete, this building is a captivating blend of past and present – and its location is perfect for evenings and weekends when you want a relaxing stroll along the popular Georgetown Waterfront Park or want to eat and shop your way along M and Wisconsin Streets. And no one who lives in this building can do without a stop to neighboring coffee shop and bakery, Baked and Wired, for some of the best cupcakes in the city. 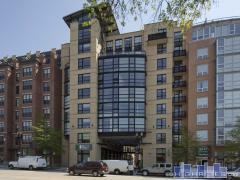 Have any comments or questions about 3303 Water Street? Ask your question and/or share your thoughts about this Building.